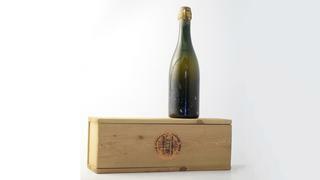 Bonhams is set to auction a bottle of rare Champagne that was rescued from a shipwreck after 80 years at the bottom of the Baltic Sea. The Heidsieck & Co Monopole 1907 Goût Américan Champagne was on board a yacht sunk by a German U-Boat during World War I and will be offered for sale at Bonhams Fine Wine Sale in London on April 14. The bottle was part of a consignment of Champagne, Cognac, wine and steel being transported to Finland by Swedish schooner The Jönköping in 1916. The yacht was detained by a U-boat whose captain ordered the crew to disembark and then sunk the boat to prevent the steel reaching the Allies. However, it wasn’t until 1998 that salvage operations began to take place on the yacht — which is surely destined to become one of the best shipwreck dives. Two thousand bottles of Champagne were recovered and, amazingly, the wine is still sparkling and said to be in very good condition thanks to the fact it has been kept at constant low temperatures and in almost complete darkness for so many years. While this bottle — which is expected to reach £1,000-1,500 — is undoubtedly the highlight of the auction most of the major Champagne houses will be present. Among the top lots are six bottles of the 2002 limited edition James Bond 007 Champagne from Bollinger and two bottles of 1988 Vieilles Vignes Françaises, Blanc de Noirs from the same house which are expected to reach £600-700 each.